PDF: This format is great for printing your entries. PDF exports include formatted text and photos inline in each entry. HTML (Day One 2.x and later Mac only): This format can be viewed via a web browser. The exported zip file contains an HTML, JS, and CSS file and a *photos* folder. 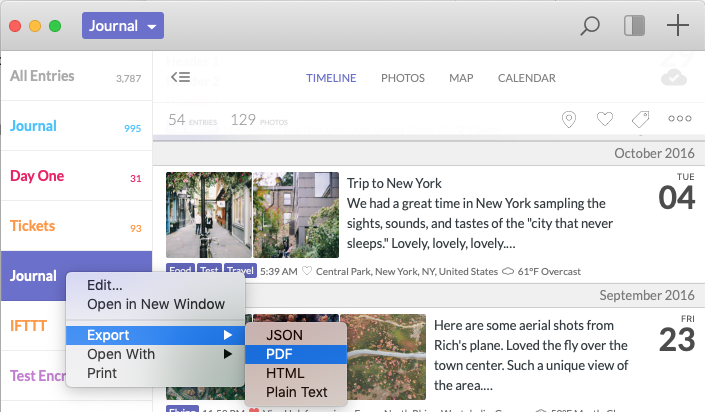 JSON (Day One 2.x and later): This format is best for re-importing archived data to Day One and for other programmatic uses of your entries and photos in other systems and apps that support Day One JSON files. The exported zip file includes a .json file with all your selected entries and a *photos* folder. Learn more about JSON. Plain Text: This exports a zip file that contains a single text file with all your selected entries. These entries include inline *references* to photos (not the actual photos). The actual photos are in an included *photos* folder. Go to Day One > Settings > Import/Export. Select the journal you wish to export. Set your desired date range. If you want to export only entries with a specific tag, toggle on Only Tagged Entries, then select the tags you want. There are additional PDF settings that can be selected. You can also swipe on entries in the Timeline view and tap the share icon. Or use the multi-select tool to export several selected entries. Go to File > Export. 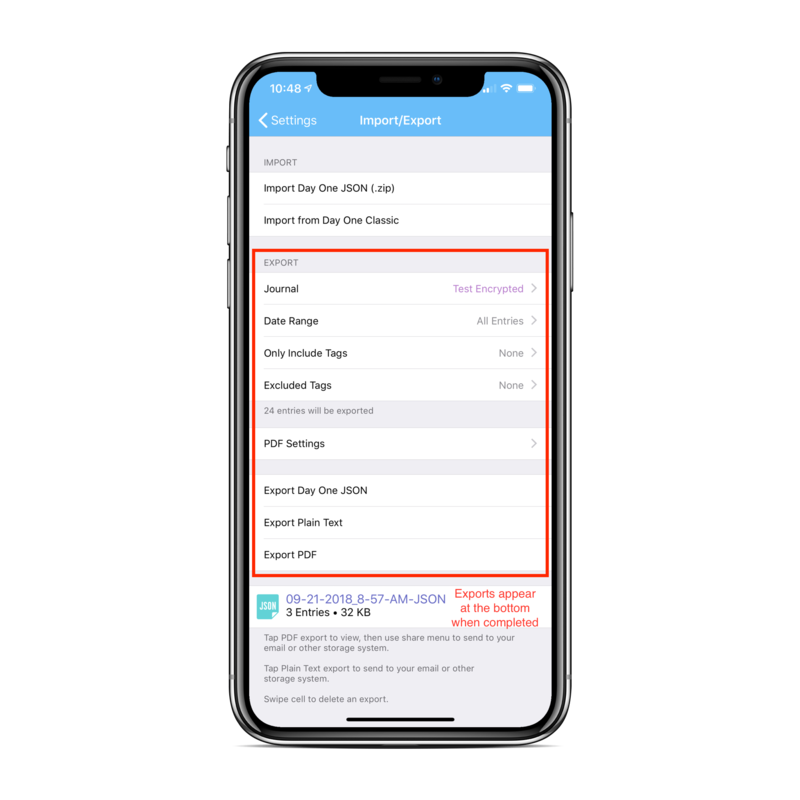 Choose the file format you want to export and follow any additional on-screen prompts and dialogs for completing your export. (See above for an explanation of each file format.). Right-click (control+click) on a journal in the journal pane. Choose Export > and the format you want to use. Right-click on one of the selected entries. TIP: If you apply a filter, you can export just those entries by clicking the More options icon (•••), then clicking Export and selecting your export format. After the export completes, choose whether to share the file or save it to the Day One system folder. Select the format you want to use. Supported export formats: PDF (Sample Day One PDF), plain text, and Markdown. Choose your preferred export format. 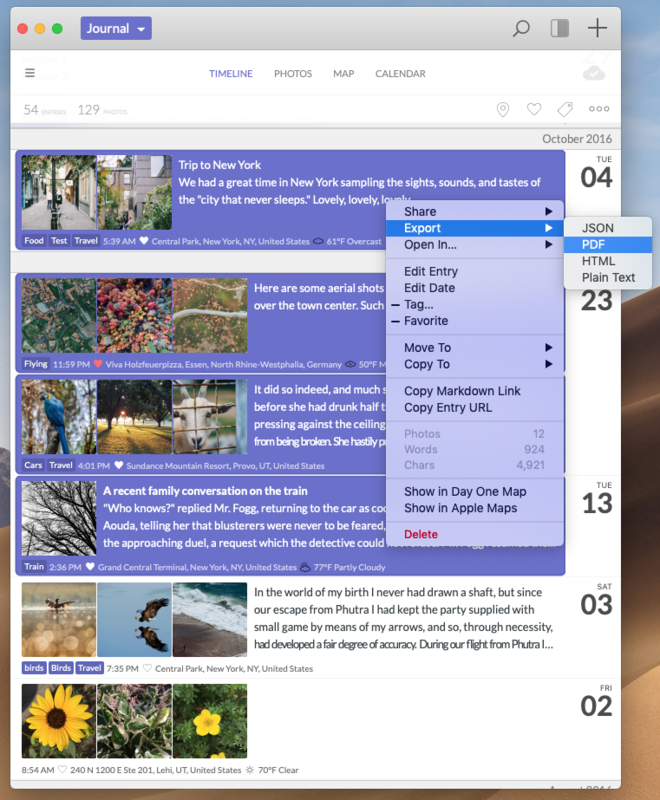 Go to Calendar or Timeline views. Apply preferred filters (top left row of icons). Click the export icon (icon next to the search icon). Click "Export" from the dropdown menu. Control-click the entry you want to export, then click "Export." Supported export formats: PDF (Sample Day One PDF) and plain text. Go to Settings > Export to PDF. Tap "Export" in the top left. Tap the share/export icon (top right), then choose a preferred destination for your PDF. Swipe the entry you want to export to reveal the entry options. Tap the share/export icon (three dots). Swipe the edit bar horizontally from the left to the right until the first dot above the edit bar is highlighted. C. Export "Only Tagged Entries"
To export only tagged entries, tap the Only Tagged Entries toggle. Select the tag(s) you wish to use.